Nine homes changed hands in Davisville Village last month, including three detached, five semi-detached, and one attached home, marking a 28.6% increase over the seven home sales we saw in March of last year. 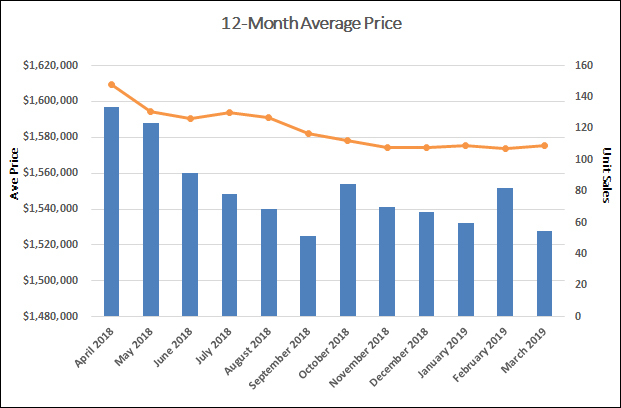 The average value of the seven March 2019 home sales, however, dropped to $1,402,722, an 19.3% decrease from last year’s March mean of $1,737,857. Last month, detached homes were valued at an average price of $1,622,500, a 31.7% drop from last year’s average of $2,375,000. Over the first three months of 2019, 20 homes have changed hands in Davisville Village. This marks a 5.3% increase compared to the year-to-date March 2018 sales figures, which saw 19 completed transactions. Five detached homes have found new owners so far this year, with an average transaction value of $1,908,500. This is a 1% increase compared to the average sale price of $1,889,400 for the 10 detached homes that changed hands in March of 2018. 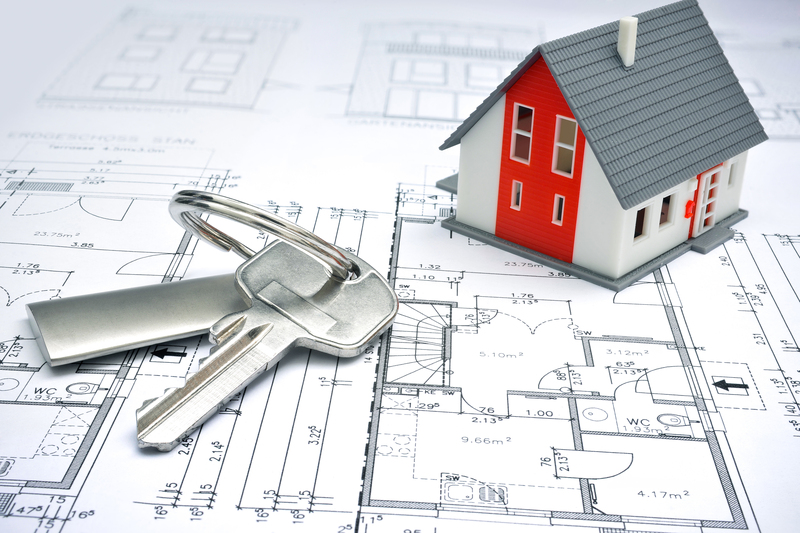 Semi-detached home sales increased by 133.3% compared to last year, rising from six sales to 14. The average value of Davisville Village semi-detached homes also increased 14.5% compared to March 2018, from $1,261,667 to $1,444,857. Davisville Village monthly home sales up by 28.6% over last year! 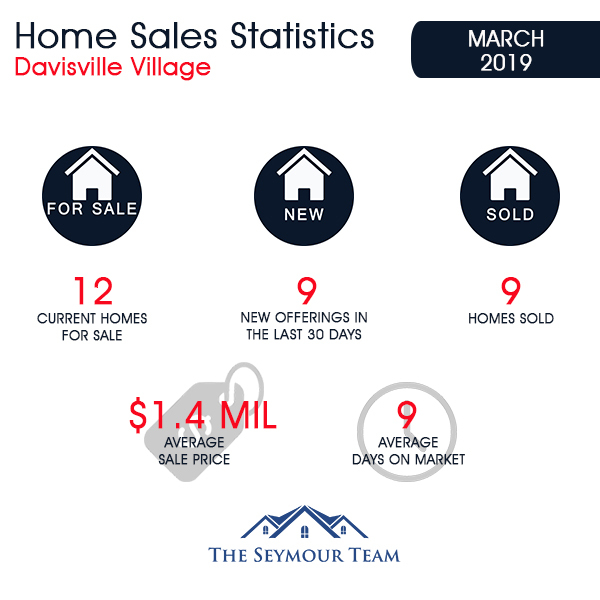 As of April 3, 2019, there are 12 homes on the market in the Davisville Village area. These homes range in price from $1,299,999 for a semi-detached home on Tilson Road (seven days on the market) to $2,975,000 for a detached home on Hillsdale Avenue East (15 days on the market). Last month, the average time to sell a home was nine days; one home on Hillsdale Avenue East sold three days after it was listed, while the longest remained on the market for 10 days. This doesn't include the three homes that had been listed for more than 30 days or the nine homes that were listed in the month of March and are not selling at their current listed prices. 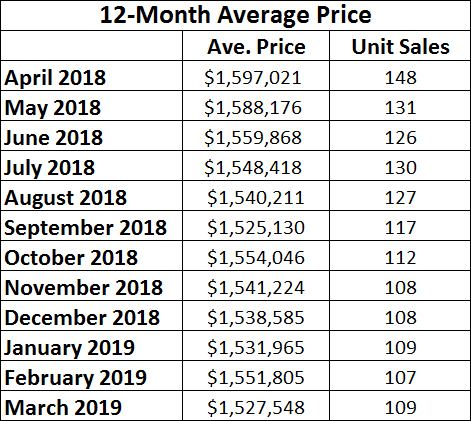 Eight of the nine March 2019 home sales sold at or above their listed price. The most valuable Davisville Village home sale of the month was a detached 3-bedroom, 4-bathroom home on a 24 x 150 -foot lot with a private drive and garage on Cleveland Street. It sold for 105% of the asking price. It was followed by a home on Servington Crescent which sold for 91% of its original asking price. Entry into the Davisville Village market now requires buyers to spend $1,300,000 for a semi-detached home and at least $1,800,000 for a detached home. Buyers continue to look for homes in midtown while low inventory endures as the main driver of competitive bidding. View home sales statistics for February 2019 here..